A new study by researchers from Stockholm University and the University of Zürich shows that the size of the female’s reproductive tract holds the key for understanding how males make sperm. 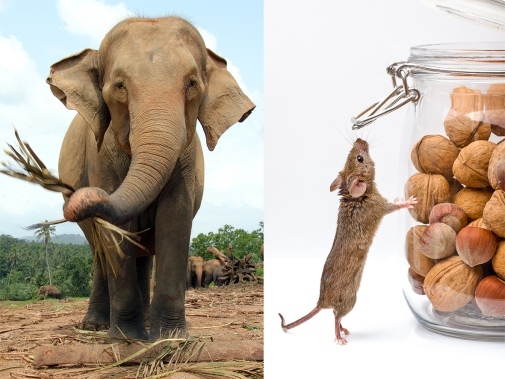 The sperm of the Asian elephant has the shortest sperm relative to its body size, whereas the house mouse (Mus musculus) has the longest. Humans and elephants have sperm of roughly the same length, less than half the size of mouse sperm. Photo: Mostphotos. “The sperm of rodents is at least twice as long as sperm of large mammals like primates, tigers, and even whales. We wanted to know why sperm sizes differ so dramatically when they all have the same task – to fertilize eggs”, says John Fitzpatrick, associate senior lecturer at Stockholm University. John Fitzpatrick and his colleague Stefan Lüpold, from the University of Zürich, examined how competition between sperm from different males and the size of the female reproductive tract influence the evolution of sperm in 100 mammalian species. Their approach assessed both sperm length and the number of sperm in an ejaculate. This is important because the resources used to produce sperm must be shared between number and size. In other words – the longer sperm, the less can be produced. John Fitzpatrick and Stefan Lüpold have also found that the size of the female influences whether it is better for a male to produce longer or more sperm. In larger females, with bigger reproductive tracts, sperm can be lost or diluted on their journey to the egg. Therefore, in larger species males produce a lot of tiny sperm. In contrast, in small species where sperm have an easier time finding the egg, males produce comparatively longer sperm. “This demonstrates that the location where sperm compete – inside the female’s reproductive tract in mammals – determines when it pays a male to produce longer or more sperm”, John Fitzpatrick says. The study is published this week in the Proceedings of the Royal Society of London.